Schutzhund and the German Shepherd Dog. The main purpose of this dog sport is to emphasize the correct working temperament and abilities within the German Shepherd Dog breed. While dogs of many other breeds also participate in the sport of Schutzhund, this dog breed evaluation test was developed specifically for the German Shepherd Dog. Max von Stephanitz, the creator of the German Shepherd Dog breed, also created the Verein für Deutsche Schäferhunde, or SV, as the official governing body for the German Shepherd Dog breed. 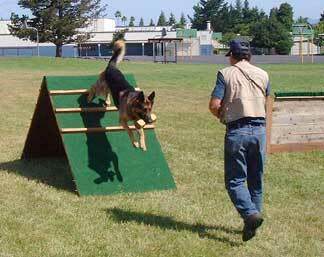 The SV then created the schutzhund trial as a breed test for the German Shepherd Dog. The trial, along with the SV's conviction that "German Shepherd breeding is working dog breeding, or it is not German Shepherd breeding" led to the rapid development of the GSD breed's working abilities right from the start. The Verein fur Deutsche Schaferhunde (SV), the parent club, developed the Schutzhund test to make sure that all GSD breeding stock was sound of both mind and body. Since the original conception years ago, many other countries and working dog organizations have also adopted Schutzhund as both a sport and as a test of working dog performance. Because of the spread of this sport, international rules have also been established which are further administered by the Verein fur Deutsche Hundesport (VDH). Schutzhund (German for "protection dog") trials are an important element in the training and development of the German Shepherd - especially in the United States, Germany and Europe. While dogs of many other breeds also actively participate in the sport, this breed evaluation test was developed specifically for the German Shepherd Dog over 100 years ago. Schutzhund trials are a sport for the working dog with the intention of demonstrating the dog's overall intelligence and utility abilities and cover three separate phases. The very first Schutzhund trial was held in Germany in 1901. Schutzhund and the German Shepherd is an exciting dog sport that offers an opportunity for any dog owner to train their dog and to compete with other dogs and dog owners. When people hear the word Schutzhund they often think of the exciting protection test but there are 2 other tests as well included within the sport. People of all ages and physical abilities, even those with disabilities, also enjoy the sport. Oftentimes you may find all members of an entire family participating in this activity. All sizes and types of dog breeds are eligible but the minimum age requirement is 15 months. The BH or companion dog title (elementary obedience) is a pre-requirement for any Schutzhund title. Schutzhund and the German Shepherd: work concentrates on only three individual sections which are outlined below. 1. In the tracking phase the dog must follow scent from human footprints left by a stranger. The track is laid by someone walking normally on a natural surface such as dirt, concrete or grass or any surface of the judge's choosing. The track includes a number of turns and several small, man made objects left by this person who laid the track itself. Holding on to the end of a long leash, the handler follows the dog, which is expected to scent the track. vThe dog is also expected to indicate the location of the objects left by the stranger, usually by lying down with it between its front paws. The tracking phase is intended to test the dog's ability to scent, as well as its mental and physical endurance levels. A temperament test is also included to check the dog's mental soundness. Tracking courses become more difficult as the dog goes on to higher levels. 2. In the obedience phase of Schutzhund and the German Shepherd, the dog works both on and off lead. This section includes a series of heeling exercises, a gun shot test (to see how the dog reacts to sharp noises), and a series of field exercises. Here the dog is commanded to sit, stand, and lie down while the handler continues to move. Also, the dog is required to retrieve dumbbells of varying weights and sizes over various surfaces, walls and hurdles. Each of the strenuous training exercises involved are designed as tests of the dog's temperament, structural efficiencies and its willingness to serve its owner. 3. The protection phase of Schutzhund and the German Shepherd is the part most people think about when they hear the word Schutzhund. This is the ultimate test of the dog's courage, mental abilities, physical strength, and agility. Most importantly, the handler's control of the dog is absolutely essential as well as to how well the dog responds to the commands of it's owner. Schutzhund and the German Shepherd contains many exciting exercises including: a search of typical hiding places, finding a hidden "bad guy", and guarding that "bad guy" until the handler gets there. The dog is expected to defend his handler against the threat of the "bad guy" in a staged assault. This attack decoy wears a specially padded suit with a well padded sleeve that the dog will get to bite during the test. The dog must react instantly to the dogs handler's commands. This protection tests is intended simply to insure that the dog possesses the proper temperament, courage and mental stability necessary for breeding. More tips for Schutzhund and the German Shepherd: Additionally, Schutzhund trials also are offered in three levels of difficulty: Sch 1, Sch 2, and Sch 3. Each level is progressively harder than the previous one. In Germany a dog must receive a Schutzhund title before it is allowed to be bred. So the importance of Schutzhund cannot be overstated.